Shop, save money and support CP! 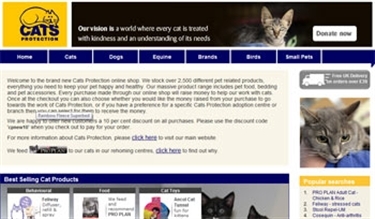 We are pleased to let you know that Cats Protection has just launched a new online shop, www.cpshop.co.uk. CP will receive all of the profits from each sale. You can choose whether the money raised from their purchase will go towards the work of Cats Protection as a whole or towards the branch or adoption centre of your choice. * Some remote UK postcodes are subject to an additional delivery surcharge. Please visit the online shop for more details.